Spring has sprung and the season for quick change layers is here. A cozy sweater in the morning that can double as a jacket when the sun goes down is perfect for the mercurial weather of May in New England. Willow is a cozy spring jacket or cardigan with a simple, allover broken rib pattern, and a pretty (and easy) cable and lace panel up the back. The yarn is soft and wooly, lovely to knit with, and the bulky gauge makes for a very quick knit! The body is worked from the bottom up. The stitches for the sleeves are picked up and worked down in the round. The only seaming is at the shoulders, the back of the collar and the patch pockets. And the pockets, how perfect! We’re so charmed by this cardigan that we’re teaming up with Cecily for an exciting giveaway! One lucky knitter will receive a PDF copy of the pattern along with enough Peruvia Quick (in the color of their choice) to knit a Willow of their own. ENTER: Leave a comment telling us your favorite shade of Peruvia Quick (view shade card here). DETAILS: Must be 18 years or older and a resident of the U.S. or Canada to be eligible for the prize. Comments must be posted by 11:59 PM EST on Sunday, May 10, 2015. One winner will be chosen at random and announced on the blog next Monday, May 11. Caramelo looks yummy. Thanks for the chance to win this beautiful yarn and pattern! Great pattern, great-looking yarn and a wonderful giveaway! I think the Palomino Blue would be a great color for that sweater–and it is a bit of a departure from what is already in my closet, which s always good! This was almost an impossible task. I love several of the colors, such as bing cherry, dragon and rio. I think that’s the color I would go with first, the rio. I’m loving the Bing Cherry! It would go with so many things in my wardrobe! So many beautiful colors, choosing one is not an easy task; but I think I’d go with Sea Turtle for this pattern. The colors are lovely. It was hard to choose. I would probably use Noche, if it looks like tweedy, faded blue jeans, as it does on my screen. The sweater looks like it would knit up quickly. Thanks for the giveaway. Caramelo! What a pretty neutral color. Oats would be great for a Spring sweater. Also like Niebla, but I have lots of grey already. Boysenberry is calling to me. 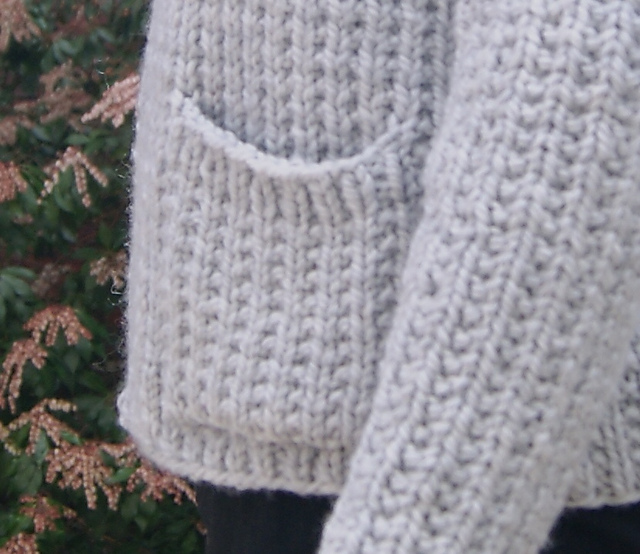 What a cozy cardigan! I love the Sea Turtle colorway, but I might choose gris marengo to make this sweater because I need to replace a much-loved, worn-through gray cardigan. I think if I were to win I’d like to make my Willow in Rio. Sounds exotic, doesn’t it? Love the Noche – but all the colors are so beautiful! Noche, because I am a winter. Aquamarina would be the color I’d love to make the sweater, it’s my favorite color. It would be beautiful. I just fell in love with Sea Turtle. Blue Nile is simply beautiful! Azul Violeta…amazing colour! How i would love a sweater made out of this! I think Noche would be lovely in Willow in my closet. Yet, it was very hard to choose! Thank you for the wonderful giveaway. Dragon looks like an intriguing color. My eye was immediately drawn to Aquamarina, but then the Noche distracted me, and then I saw the Blue Nile. It’s hard to choose just one color. It’s so difficult to pick one color! Today I would choose saddle brown. Tomorrow it could be something totally different! LOL! Hard to choose one color but I think Aquamarina. This would be beautiful in Blue Nile. What a lovely giveaway! I love Aquamarina. It makes me think of ocean beaches on a cool and slightly breezy day. So difficult to choose, but I select Noche. would love to have a sweater in gris meringo. Lupine! I’ve always loved Peruvian, but haven’t yet tried Peruvian Quick, and would love to, beautiful pattern. Such a pretty design. Niebla would be my color choice. Thanks for the great giveaway! I love Rio and Palomino Blue. I just love the Broken Rib stitch with the pretty lace panel up the back!!! Perfect quick summer jacket in Boysenberry. I’d prefer Cherry but almost everything I own for summer is hot pink or purple so I’m stuck with Boysenberry!!! LOL I’m not sure I can wait, I may have to get that pattern & start knitting tomorrow. Wow, hard to choose. I like both Carmelo and Saddle Brown equally. I love black/grey and Fumar is perfect. I love neutrals, and the Fumar colorway is perfect! For this sweater, Oats would be a lovely neutral color choice. Second fave would be Sea Turtle, because you can never have too much green. I love the Blue Nile. The pattern is very nice. Thank you for the chance…. carmello would be my pick!! I love Noche! The pattern is beautiful….thank you so much for the chance yo win! I like them all ,but if I had to pick it would be Niebla, it looks refreshing. Caliente is the color for me! Thanks for the opportunity to win! Difinately, Dragon. Thanks for the contest. Its always fun. Noche would be gorgeous in this pattern! Lupine but I think Gris Marengo would go with more outfits. My favorite is Palomino Blue I would love to have this sweater in that color! Dragon looks interesting for a sweater or shawl pattern. I’m wearing two gray sweaters at the moment (in sunny California)–so Bing Cherry! I love the Dragon color – as I’ve cross stitched a few dragon pictures and have dragon ornaments, this name calls to me. Blue Nile is definitely my fave! Yummy Niebla would make a perfect summer / spring sweater and would show off the stitch pattern quite well! What a gorgeous pattern! I love this yarn. There are so many wonderful colors, but I think that Caramelo would be beautiful in this sweater. Choose a favorite? You must be kidding! But because I’m lunching in a Mexican restaurant on Cinco de Mayo, and I’m sensing a trend, I must choose Azul Violeta. Rio is my favorite color of this yarn. Noche is my favorite color. What beautiful colors but I think I am gravitating towards the Blue Nile colorway. Noche looks like the perfect color to wear with jeans. Carmelo…would look gorgeous in this color! My favorite shade is Noche. A nice go anywhere color in the jean dominated world. I love the caliente! Perfect on cinqo de mayo. Thanks for the giveaway! love noche, and love the pattern! Azul Violeta! What a wonderful color! Love this pattern! Love so many of the colors, but I think I’d put Noche as my #1. The colors are all so beautiful it is hard to choose. BUT maize just gives me a cheerful uplift! Dragon…would go nicely with everything! Sea Turtle. I love the ocean and those big turtles so perfect color! So hard to choose — the colors are wonderful! I think I’d have to go with Rio (but might change my mind to Azul Violetta or Aquamarina). All the colors are lovely so hard to pick just one! I would knit the pattern using Caliente. Lovely pattern! It’s a hard choice, but I’d love to make it in Noche! Blue is my favorite color so I would love Rio. What a fabulous sweater!, love the knit stitch combinations! So utterly comfy looking. I would love to have the time to make one in every colour!! although Dragon is whispering sweet nothings to me. Great pattern and Niebla is my choice! i think i’d like this in oats. Lupine is my favorite! I’m a sucker for purples. Sea Turtle. Or Noche. Or the two together. Thank you. I love the Noche colorway. Beautiful sweater. Wow, lots of fabulous colors from which to choose, but Blue Nile is attracting my attention. Thank you for this opportunity! I like Oats the best. It would go with everything. Love the pattern. So perfect for a sweater/jacket. Oh, it’s so hard to choose one color! I think Noche would be very versatile, however. Azul violeta would be my choice. Beautiful blue violet! Aquamarina, without question. I love blue-greens! All the colors are gorgeous, it’s so hard to pick I’d take absolutely any one of them, and I love love love the pattern for this cardigan/jacket! My eyes fall to the Palomino though, love the color, love the name, love the horse! Thanks. That’s a difficult choice, but Azul Violeta really rings my chimes. I tend to go toward the neutral colors…….I like OATS. Gris Marengo is my favorite! I’ve always loved the heathery shades of Peruvia – such a yummy, soft yarn, too. Hard to choose just one color, but I’ll take the beautiful Aquamarine. My favorite color is aquamarina. Gris Marengo is a lovely gray! I think it would make a versatile & lovely winter coat in that yummy waffle stitch. I can’t decide between Bing Cherry, Blue Nile or Ultramarina! Great sweater pattern and too many lovely colors from which to choose. It has to be Lupine for me. I really like the Caliente and the Sea Turtle. Sea turtle. I live in SW FL. and sea turtle “season” just began! I’m partial to the Palomino Blue — it’s such a wearable color! Aquamarine, though it’s hard to pick just one! They are all beautiful but I especially like boysenberry. :)Lovely yarn! Love the Lupine!!!! But I also love Caliente – too many beautiful ones to choose from. Gris Marengo, great color, goes with everything! Dragon is the color I like the best, thanks! Aquamarine would be my choice! I absolutely love Blue Nile. Great color with my jeans or just about anything. Tough choice! I am going with Dragon. Azul Violeta definitely! I turned 68 this year and I am redoing my wardrobe and my style to reflect the goddess that lives inside me the woman of wisdom and caring and caring and sharing and so with my silver white hair this color would be wonderful! I love the Gris Marengo beautiful gray….to late for giveaway but how do we get the pattern? Click on the name of the sweater in the post above to go directly to the pattern page on Ravelry where it is available as a PDF download.